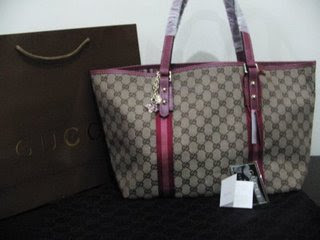 Fashion Asia: Hot Gucci Mama?? Anyway, I'm currently looking for "THE bag". I know i know....i just bought the expensive JP diaper bag right? Well, though i love it and hubby loves it too....well.....its a little impractical for me cos i find it rather heavy on its own, what more filled with baby stuffs. Can someone just slap me and tell me i shouldn't be spending so much money on a handbag when I should be saving up for my baby girls diapers, milk powder, education...etc.!?!? Well, I haven't make that purchase yet....but but but.....it looks rather practical as a mummy bag doesn't it?!? I bought a Coach tote as a diaper bag when my boy was born 2 yrs ago...I'm still using it now, as a diaper bag and office bag...one bag for 2 functions..y not ?!! maybe u should look at a different design...like a sling....so it wont roll off your shoulder since u hav something similar d? If you wanna get it, just buy lor..money is for spending wat..keep so much for wat...can always earn back. Sometimes, a great bag is so worth it. Maybe that can be your mommy present? investment advisor when you got time. security services when you got time. Bag color was little bit dull but the design was good.. nice blog..
i hope what i'm bout to say helps.. but i can probably help you out with this. I'm a Malaysian living in California, and every time after thanksgiving i head to the outlets and buy branded bags for sooo much more less.. If haven't got one yet, let me know. The only downside is, you would have to wait till thanksgiving, but i think its worth it since its cheaperrr.